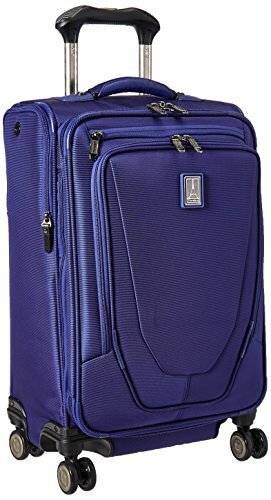 The Travelpro Crew 11 Expandable Spinner Carry-On Suiter Suitcase is the civilian version of the famous traveler's bag that professional flight crews have depended on for decades the world over. Includes an external USB port for powering up any USB-powered device from the dedicated charger pocket that makes searching for an open wall outlet a thing of the past (portable charger/power pack not included). Constructed of high-quality ballistic nylon with a DuraGuard coating for stain and scratch resistance, this durable luggage rolls along smoothly in any direction without drifting on eight MagnaTrac self-aligning wheels. The carry-on bag is pulled by a PowerScope Extension Handle that reduces wobbling and features stops at 38", 40" and 42.5" lengths. Smart packing is easy and secure in this durable suitcase that expands two extra inches and offers a deluxe suiter to help keep suits, dresses, and dress shirts wrinkle-free during transport, adjustable hold-down straps, a full-length interior lid pocket, wet pocket and damage-resistant SUPRA Zipper heads. This carry-on bag has been sizer-bin tested to accommodate overhead bin space on most major US airlines. Exterior: 100% nylon. Lining: 100% polyester. Imported. Includes a Limited Lifetime Warranty.